Because there are many causes of back pain, it’s unfortunately not just a case of starting a new diet and assuming that will cure everything, unless the back pain is associated with a particular nutrient such as vitamin D, or a specific disorder such as constipation. Healthy eating can help with back pain however, by improving general health and well-being. 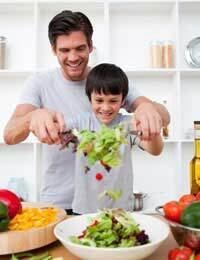 Eating a healthy diet and maintaining a healthy weight can also help prevent and reduce other diet-related health problems, such as heart disease and diabetes. For more information about specific causes of back pain and diet, see ‘Can Diet Improve Back Pain’. Healthy eating means eating a balanced diet that contains plenty of fresh fruit and vegetables (at least five portions a day), wholegrains, including whole-wheat bread and pasta and brown rice, low fat meat and fish (or vegetarian sources of protein such as soya), and low fat dairy foods. Cut down on fat, sugar and salt, and drink plenty of low sugar and sugar-free fluids, including water. A rough suggestion of calorie intake per day is 2000 for women and 2500 for men, but this of course depends on activity levels. Reducing below this will help with weight loss, but avoid very low calorie diets as these can harm the health in the long run. Being overweight puts a strain on the muscles and joints in the back, which can make them ache and be more vulnerable to injury. Exercise helps prevent and treat back pain, and being overweight can also make exercising more difficult. For some people, being overweight saps their confidence and makes them stressed, and stress and muscle tension can be a major contributor to back pain. Losing weight and feeling fitter can improve confidence and so reduce stress, therefore reducing the back pain. Being overweight can affect sleep, and this can also worsen stress. Eating a healthy diet makes it easier to reach and maintain a healthy weight. Before trying to lose weight or starting to exercise, it’s a good idea to talk to a doctor or nurse, especially when there is a lot of weight to lose. Constipation can cause back pain when the colon becomes too full and causes pressure on the lower back. A healthy diet should include plenty of fibre from pulses, cooked wholegrains, pasta, and fresh fruit and vegetables, and this will prevent and treat constipation. Fluids can also help prevent and treat constipation – this comes from having regular glasses of water, but also from food. Avoid using laxatives too often, as these can be harmful. For some people, back pain may be caused by a lack of vitamin D, which helps maintain calcium levels in the bones, so keeping the bones healthy and strong, and preventing them from becoming soft (rickets in children or osteomalacia in adults). Vitamin D in the diet comes from meat, oily fish, dairy and eggs, and is made in the skin when it is exposed to the sun. Eating well can help with back pain just by making you feel healthier and fitter overall, and giving you more energy.